The mystical Taliesin is another treasured character from The Ancient Future by Traci Harding. His violet eyes and magical abilities were what came to mind when using this purple sparkly yarn. The Celtic cables with its many twists and turns complements Taliesin’s many plans and abilities. The buttons along the raglan edge creates a larger neckline to help with dressing. 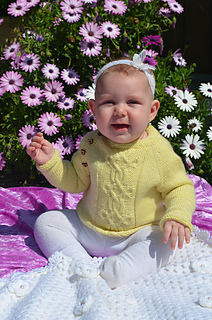 This long sleeved sweater will keep your little one warm. 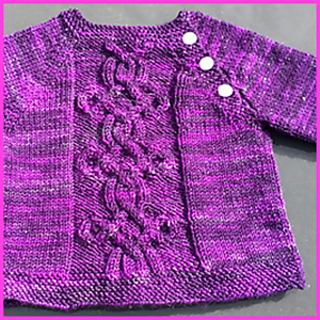 Advanced Beginner - you will need to know how to work in the round, read charts (written instructions also provided) and work cables and buttonholes.